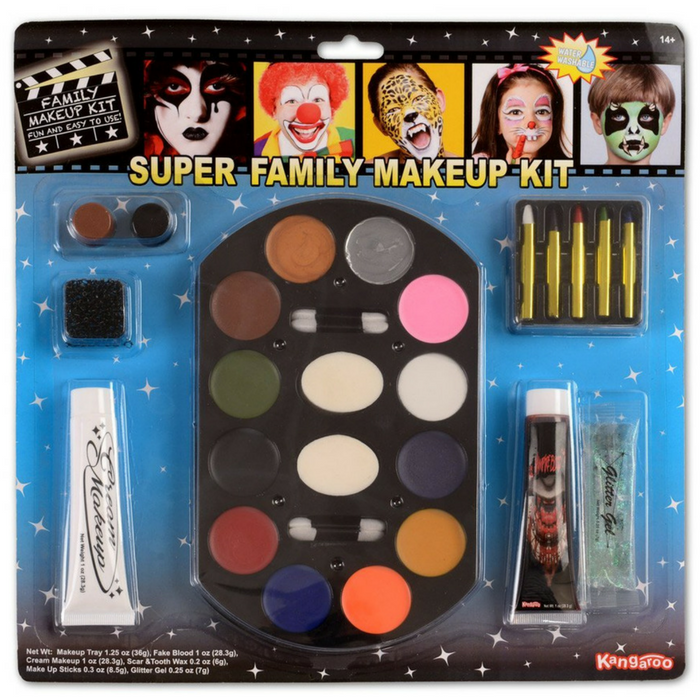 Super Jumbo Value Deluxe Family Halloween Makeup Kit Just $8.47! You are here: Home / Great Deals / Amazon Deals / Super Jumbo Value Deluxe Family Halloween Makeup Kit Just $8.47! Looking for a Halloween face makeup? Amazon is currently offering this #1 Best Seller Super Jumbo Value Deluxe Family Halloween Makeup Kit for just $8.47 PLUS FREE shipping with Amazon Prime or for orders over $25! This Makeup Halloween includes: 12 Color Halloween Makeup Palette, 5 Colored Makeup Pencils, Tooth Black Out, Fake Blood, Glitter Gel Makeup, Fake Skin and Applicators! Great for Halloween, party time, play time or any time! Everything in the kit washes off with warm water and soap. Also great for a stage makeup kit. Overall, it’s a perfect Halloween face makeup!